Beer lovers are in for a treat at the newest Taste Cumbria food festival in Kirkby Lonsdale this Easter. The Brewery is Taste Cumbria’s newest sponsor and the team will also be playing host to the event’s beer festival in its beautiful Royal Barn venue in New Road over the festival weekend. A selection of their ales, plus beers and ciders from across the county, will be on sale, alongside the new Taste Cumbria Easter Brew. Stuart Taylor of Kirkby Lonsdale Brewery has created the new ale and given it an Easter flavour, courtesy of another famed Cumbrian business – Kennedys Fine Chocolates of Orton, near Penrith. Stuart said: “The 6% porter has been made with dark Belgian chocolate and I’ve also used super fruity citra hops which have given the rich chocolatey brew a citrus edge. 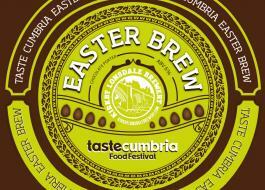 The Taste Cumbria Easter Brew will be on sale in the brewery’s Royal Barn in Kirkby Lonsdale from Tuesday 28 March until the festival, and until stocks last. This is the first time Taste Cumbria has been held in Kirkby Lonsdale. Dozens of food and drink producers will be selling their wares, while some of the county’s best chefs will be demonstrating their talents, with special areas set aside for the youngest visitors to get involved. Plans are also being made to get local businesses involved to offer tastings, special offers and more fun activities to everyone who comes to town. Taste Cumbria Kirkby Lonsdale has a wealth of local sponsors. In addition to Kirkby Lonsdale Brewery, the festival’s supporters are Hipping Hall, the country house hotel and restaurant at nearby Cowan Bridge, and Mill House Cottages, which offers luxurious self catering accommodation. Udale Speciality Foods, which supplies high quality meat to pubs, restaurants and hotels throughout the UK, is sponsoring the Taste Cumbria demo kitchen. The Taste Cumbria festivals are organised by Carlisle-based CN Events in association with Cumbria Life magazine. For more details about the Kirkby Lonsdale festival or any of the Taste Cumbria events visit www.tastecumbria.com or follow Taste Cumbria on Facebook and Twitter. Food and drink businesses who would like a trade stand can call 01228 612000 or email carrie.buchanan@cnmedia.co.uk for information.